Aside from providing protection, a fence can do wonders to enhance the appearance of one’s home. Before starting construction, there are a few basic planning steps that should be taken. This is true for starting anew or even if you plan to replace an existing fence. Start with a floor plan that outlines where the fence will be located including any gates that are to be constructed. Decide on a height, style and material, and whether the fence will remain natural or be stained or painted. Once you have your plan, it’s a good idea to meet with the neighbors who will share the fence with you. You should establish fence location and property lines prior to constructing the fence to avoid a later dispute. Don’t assume that a new fence can be built exactly where an existing one stands. Frequently a fence is built on one side or the other of the property line or may not follow the property line. Although most residential fences don’t require a permit, it’s a good idea to visit your local permit office to make sure that your fence is in complete compliance with local building codes. The permit office may even offer some boiler-plate specifications that will assist you. There are a variety of materials that can be used, with redwood and cedar among the most popular due to their ability to resist rot. This is especially important for fence posts which, due to their contact with the earth, are most susceptible to rot. Fence posts, usually four inches square for most conventional fences, can be purchased pressure treated with a pesticide like Copper Chrome Arsenate (CCA) for added protection against rot. The portion of a non-pressure-treated post that goes in the ground should be dipped in a solution of copper or zinc naphthenate. Check out the chart for planting your post. Start the fence-building process by marking the corners of the fence with wooden stakes driven about 10 to 12 inches into the ground. Using string or a carpenter’s chalk line, connect all of the corners. The string should be taut and should not touch the ground. Next, divide the overall distance of each run by six to eight feet, and drive stakes in the ground at each of these locations. Remove the string and, using a post-hole digger, dig holes at each of the staked locations. The depth of the holes should be about one half the height of the fence and the diameter about two and one half times the size of the post. If you can find a friend willing to help, consider renting a two-person auger and speed up the process. To minimize the threat of rot, add about a shovel full of gravel to the bottom of each hole before inserting the post. The gravel will improve the drainage and keep the bottom of the post from sitting in water. Set the corner posts first, since they will serve as your guide for the remaining ones. Use a carpenter’s level to make sure that the corner posts are plumb in two directions. Temporarily brace them using a couple of pieces of scrap lumber, some stakes and duplex nails. The braces should be at right angles to one another for maximum strength. With the corner posts securely in place, run a string line from the top of one corner post to the top of the other. Do the same at the bottom about a foot off of the ground. These strings will establish proper alignment for each of the intermediate posts and make installation easier. For big jobs you might want to rent a trailer with ready mixed concrete that can be wheeled to each hole. Fence-post concrete purchased by the sack will usually work for the average job. Figure about a sack of concrete for each hole more for taller fences, less for shorter fences. Each sack of concrete can be mixed in a wheelbarrow at each post location. When mixing concrete use a pointed shovel and a water hose with a nozzle to control the amount of water. The mix should be fairly wet for the best compaction, yet not so wet that it will be difficult for the post to stand erect. Once the post is plumbed up and ready for concrete, use the pointed shovel to add the concrete to all sides of the post. Adding concrete to one side only will tend to push the post out of alignment. Concrete should be poured level with grade, and have a slight crown so that water will drain away from the post. Allow the concrete to set up for at least a day or two before attempting to install the fence rails and boards. 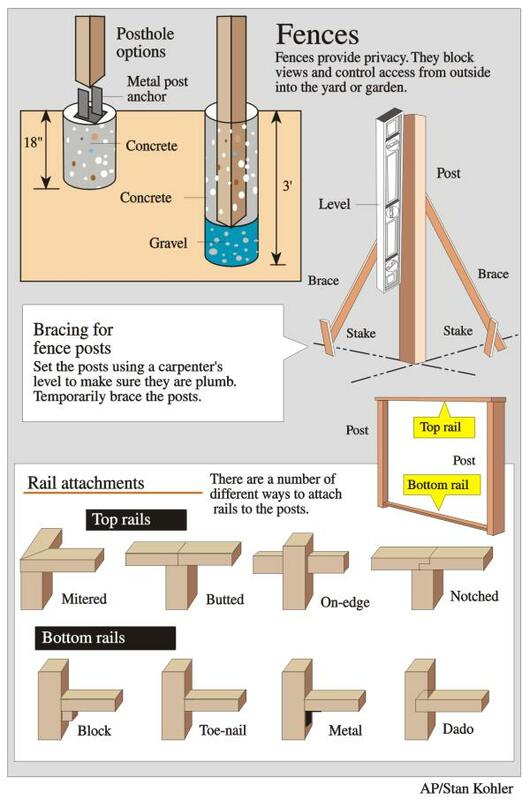 Rails for conventional fences consist of two by four material with the bottom rail butted and toe nailed to the posts, and the top rail attached to the top of each post. Metal connectors can also be used to add to the strength of the connection. Rails and fencing material should be attached with galvanized nails or screws, for maximum strength and to avoid streaking. Painting or staining the fence will offer further protection from the elements and extend the life of the fence. If a stain is preferred, use a penetrating oil-base product that will keep the wood supple. A coat of stain every three years or so should be adequate. When painting, prime the material with an oil-base prime or an alkyd modified acrylic latex. This base coat will help the finish coat to cover and will prevent unsightly tannin bleed. A high-quality low-luster acrylic latex paint will provide a durable and abrasion-resistant finish. What’s the Difference Between Concrete & Cement? Best of Show: Are you an appliance abuser?